Dog Adoption! Cat Adoption! "Friday's Friend!" 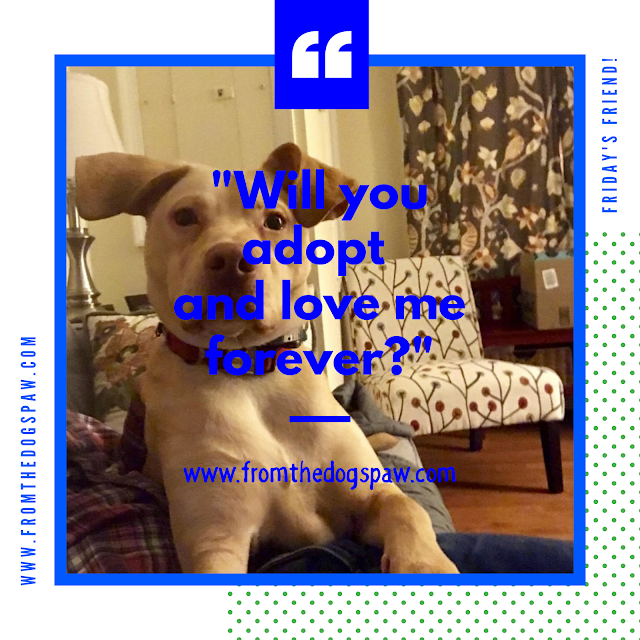 "Will you adopt and love me forever?" is a question humans need to ask themselves before adopting a dog or cat! Adoption is forever! Visit "Friday's Friend!" most Friday's to meet some of my friends from local dog and cat rescues who are looking for you - humans who need the lovin's of a pawsome dog or cat and will provide them a "Forever Home!" Labels: Cat Adoption, Cat Adoption in MD, Cat Adoption in VA, Cat Adoption in Washington DC, Dog Adoption, Dog Adoption in MD, Dog Adoption In VA, Dog Adoption in Washington D.C.